Seventeen-year-old Shelby Cooper leads a boringly routine life. She lives with her mum, Shaylene, who home-schools her, and she pretty much never goes out. Except for Fridays, when she and her mum have a regular appointment at the baseball batting cages followed by ice cream for dinner. Above all, her mother emphasises, Shelby must stay safe. If she strays from the routine, anything could happen to her, especially as Shelby is deaf. Despite all Shaylene's precautions, however, one night Shelby gets hit by a car and ends up in hospital. And that's when things start to get weird. Suddenly, she and her mum are on the run. But who from? The police? Shelby's dad, whom she always thought was dead? Nothing her mother says or does makes sense anymore. And is her mother even her mother? There Will Be Lies is a roller-coaster read of twists and turns. Just when I had been lulled into believing this was a standard 'mistaken identity crime novel', author Nick Lake mixed everything up with the addition of a dream world based on Native American mythology. As Shelby switches between 'reality' (a Thelma and Louise-type road trip with Shaylene) and the Dreaming (where the trickster of Navajo legend known as Coyote attempts to guide her on a quest to kill the Crone and rescue the Child, or else Shelby's real world may end), her search for her own identity grows ever more complex. In the process, intriguing questions regarding the importance of dreams and what really defines a 'family' are asked and (at least partially) answered. This is great writing. Nick Lake is an award-winning author and the craftsmanship behind this story is evident on every page. Shelby is an engaging narrator with a wonderfully wry sense of humour and a great turn of phrase. 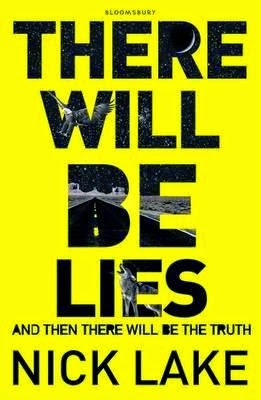 There Will Be Lies turned out to be a very different book from the one I was expecting but I thoroughly enjoyed the ride.